The heroic character of Beowulf, the nature of leadership and, hence, of the politics of the society, and the forces to which humans are subject. I believe that one can easily discern three levels on which Beowulf can be profitably read: the heroic character of Beowulf, the nature of leadership and, hence, of the politics of the society, and the forces to which humans are subject. I also believe that most of these levels are apparent from the beginning of the work. There are a few points of background that one should understand if one is to appreciate some of the nuances of the speeches and to make some of the actions of the story understandable. Most of what follows is my own view of that background, and it is not necessarily definitive. Every time I read a work, I see more in it than I saw the time before, and I have learned not to claim that I understand what anything is really about. I’ve also learned that the person who reads and thinks about what he is reading generally understands things a lot better than those who are content to judge things on the basis of a superficial reading and thoughtless conclusion. Everyone has a right to their opinion, but not all opinions are created equal. The poem seems to me to be composed of two separate works. The first section, the adventure of Grendel and his mother, is really centered on the figure of Hrothgar. The poem opens with the story of the death and funeral of Scyld Scefing, the mysterious ruler who had come to the Danes as a babe cast adrift in a box on the sea and whose body is returned in a blazing ship to wherever it was from whence he had come. 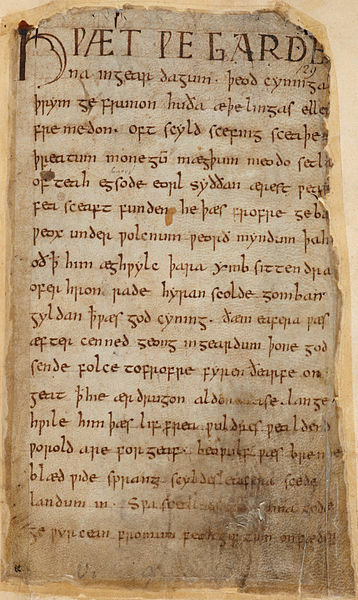 The episode as recounted in Beowulf is probably just a reference to a longer poem about Scyld, just as the mention of his son, Beowulf, “famed in Scandia,” and his grandson, Healfdeane, who divided the kingdom between his two sons, are probably references to songs in which they were the protagonists. The story of Beowulf probably takes up somewhere in the middle of a series of songs about Hrothgar. The first would have dealt with his youth and perhaps ended with his sheltering of Ecgtheow, a man cast out by his Geat kindred and being hunted down by the entire clan of the Wylfings for killing their kinsman. The second story might then have been about the building of Heorot and is the section in which Beowulf appears. It tells how Grendel, a marsh-monster, had begun to attack Heorot. The poem has several explanations of why Grendel had begun his feud with Hrothgar’s men. One is that he is offended by the sounds of happiness within the mead-hall, another is that Hrothgar, although a Christian himself, had not introduced his followers to the True God who would have protected them and taken up the feud with Grendel for killing His people. Still another is that it is simply Grendel’s nature to be nasty. Yet another reason might be that Hrothgar’s building of Heorot may have been like the building of the Tower of Babel in the Bible, a display of human pride and arrogance. Whatever the cause, Beowulf and his followers arrive to help Hrothgar. There is a good deal of tension in the gracious welcome that Hrothgar shows the young hero. 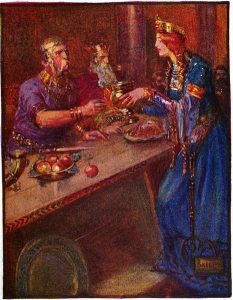 Beowulf says that he has come because he heard that Hrothgar’s men were “idle and useless,” and so the Danes needed help from a Geat champion. He shows his sword, an heirloom of his grandfather, King Hrethel. Hrothgar sets matters straight by saying that the best of his men had died in attacking Grendel during the past twelve years, and that it was he who had taken in Beowulf’s father when the Geats, including Hrethel, had thrown him out and refused to fight for him against the Wylfings. The Wylfings had, for some reason, declared a feud against Ecgtheow and were out to kill him, if possible. When his own kinsmen refused to protect him, he turned to Hrothgar, who had given him a home and had defied to Wylfings to try to take him. Moreover, Hrothgar had paid the price necessary to convince the Wylfings to call off the feud and so allow Ecgtheow to return home, to marry Hrethel’s sister and to father Beowulf himself. In the course of Hrothgar’s speech, the reader should have become aware that, contrary to his boasting, Beowulf had not come simply on a heroic quest, but to pay off a very great and long overdue debt of honor. Even so, Beowulf did not attack Grendel to aid Hrothgar as one might expected him to have done. He waited until Grendel had killed and eaten one of his own companions before taking up the fight. He waited until he was obligated to pursue a feud against Grendel as vengeance for having killed his follower. So his fight with Grendel was a personal affair, a trial by combat in which he expected God to help him because the reason for his feud was just. Nevertheless, he did not refuse the honorable gifts that Hrothgar heaped on him as compensation for having come to his aid, fighting Grendel (supposedly) on his behalf and having saved Heorot. This last point might alert the reader to some aspect of Beowulf’s character that hardly seem heroic. The third part of this poem of Hrothgar would have been the story of how Hothgar’s son-in-law rose up against him, attacked Heorot and destroyed it by fire, a fire in which Hrothgar died and the line of the descendants of Scyld Scefing came to an end. If this was in fact the sequence of the songs, these poems would have formed an epic cycle of the rise and fall of the Scefings, something like that of the Niebelungens, to whom reference is made when the mead-hall minstrel mixes his song of praise of Beowulf with the legend of Sigismund, the founder of the Niebelung family. So this part of the poem is not really about Beowulf, but has been taken from another poetic cycle. It’s a good introduction to the matter of Beowulf, though, because it tells us a good deal about our hero. 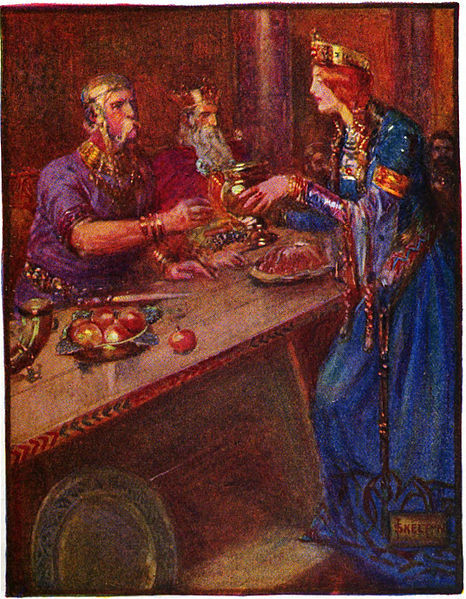 Beowulf tries to convince people that he has come only in pursuit of glory and to offer the poor Danes the assistance of a real man. He is a not a very polite guest and loses no opportunity to insult his host’s followers. He is deferential to Hrothgar, but allows one of his men to be killed so that he can claim God’s aid in personal combat with Grendel. He is unwilling to fight as Hrothgar’s champion, which suggests that he thought that Hrothgar’s cause was perhaps not sufficiently righteous for God to assist him against Grendel. Perhaps he suspected that Hrothgar may have guilty of some misdeed, and because of this God has not been willing to help his warriors when _they_ had fought Grendel and lost. Beowulf boasts that he is not afraid of Grendel, and with good reason. He has somehow discovered that Grendel cannot be harmed by weapons, which is the reason that no one had yet been able to defeat him. He doesn’t even tell his own companions about this fact. When they come to Beowulf’s aid during his wrestling match with Grendel, they are not able to help him at all with their swords and spears. So Beowulf is made to look even better by allowing his own companions to appear completely ineffectual. When the fight is over, Hrothgar suggests that God helped Beowulf defeat Grendel because it was a poor example to people to allow an evil force to triumph over humans so regularly and for so long. 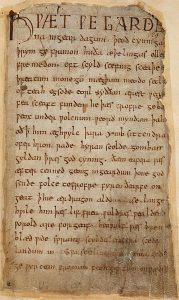 Beowulf ignores this pious reasoning and states that he won the fight on his own and that God protected Grendel (presumably as a descendant of Cain), or Beowulf would have been able to defeat him outright rather than only tearing his arm out of the socket and so allowing the monster to escape. So Beowulf strives to secure God’s aid before the combat, and then claims that God was not a help, but a hindrance, to him. 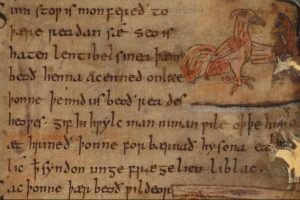 On the surface, the poet seems to portray Beowulf in an extraordinarily heroic light, but if one reads the poem closely, one finds that the poet puts the praise of Beowulf’s heroism in the mouth of Beowulf himself, and of those about him. 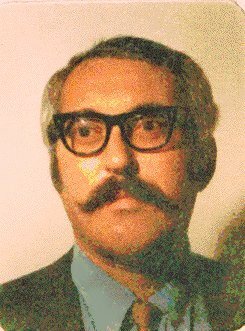 The story the poet tells is that of a man so eager for praise and glory that he is willing to deceive a gracious host to whom he owed – even if indirectly – his very life, to elevate himself by belittling those about him, to endanger his own companions and make them look bad in order to make himself look even better, and even to deny God in order to to claim victory as his own personal and unaided achievement. In the end, at the close of the poem, Beowulf will die because of his insistence upon trying to gain all of the glory of slaying a dragon for himself and to be regarded as the equal of the famous Sigismund. His own men run away at the sight of the dragon. Men learn to be courageous by acting courageously, and Beowulf has never given them the opportunity to act courageously. He has been so intent on enhancing his own reputation that he has never bothered to train champions to defend his people after his death. Nevertheless, his people treat him as the greatest of heroes and do not seem to realize the extent to which he had neglected his obligations to provide for his people’s security because of his complete absorption in his own reputation. The poet refers again and again to three forces that shape events in the world. 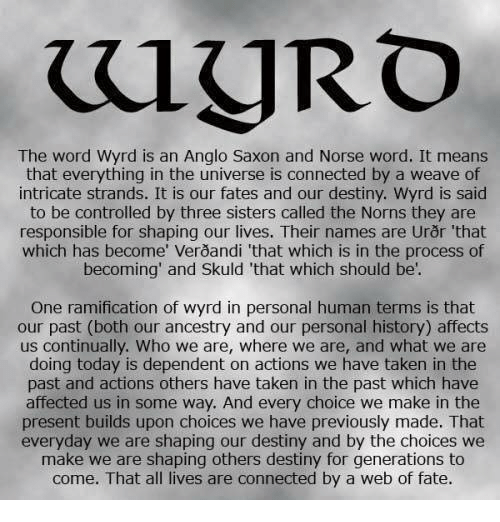 The most basic is wyrd, which is usually translated as “fate,” but means something even more basic. It appears at times to be the logic of events, but a logic that humans most often cannot discern. The Scandinavians of the time portrayed fate as a patterned cloth being woven by three supernatural women called the Norns. The symbolism is interesting. There is no hint in Scandinavian mythology that the Norns know the future. They seem to be intent on weaving a cloth bearing a complex pattern that will run the length of the cloth from the beginning of time to the end of the world. One can see that pattern of the past, and, if one studies the matter closely, one might be able to extrapolate from the pattern of the past to the pattern of the future, since patterns are inherently logical. Wotan, ruler of the gods of Asgard, has gained the power to do that, but it seems to be beyond the ability of humans. The second great power in the world is that of God. The God of Beowulf is not the sort of deity that appears in The Acts of the Apostles, The Life of Saint Martin, or The Life of Saint Anthony, however. There are no amazing miracles in Beowulf by which the power of God is made manifest to Man. The God of Beowulf works his will by nudging humans, favoring some actions and frustrating others. His power is so unobtrusive that it is possible for some people to discount it as an effective force in the human world. This is perhaps the reason that Beowulf, although he sought God’s assistance in his struggle with Grendel, once the fight was over and he had emerged victorious, he was so easily able to convince himself that he had accomplished the feat without any divine aid. The third power is that of human action. The Scandinavians believed that fate was leading to the destruction of the world, and that there was nothing they could do about it. They could order affairs in the meantime, however, and they tended to act according to rather rigid modes of behavior. They tried to keep some sort of order through the feud, an obligation upon all members of a family to seek vengeance for a wrong done to any of their relations. But they knew that the feud also led to a constant state of social warfare. They tried to ally families through intermarriages, but this never worked out. Every now and then a man of extraordinary physical ability and moral force, a hero, would arise, and would become king and protector of his people. This prowess seemed to be hereditary, but the lineage of heroes would eventually die out, just as the race of the gods of Asgard would eventually die out. But heroism must have seemed to be to the people of the time their best chance of enjoying a life of relative prosperity and security. Their culture was conditioned to create and identify heroes, and riches and fame were heaped on such men. Moreover, they were given the closest approach to immortality the society could provide — praise in poetry and song that they took great care to preserve and remember. In many ways, the songs of heroes were the school of the Scandinavians, offering their listeners models of heroic conduct and an idea of the rewards that such conduct could bring. What then should we say of Beowulf? On the surface, the poem seems to be such a model, but we cannot expect that its listeners were unaware of the undercurrents in the account. I do not believe that we can say that the poet glorified Beowulf. Instead, he was at pain to hint at the selfishness, pettiness, and deceit that underlay much of what Beowulf said and did, and to emphasize how unquestioningly the people about Beowulf accepted the heroic image he attempted to project. 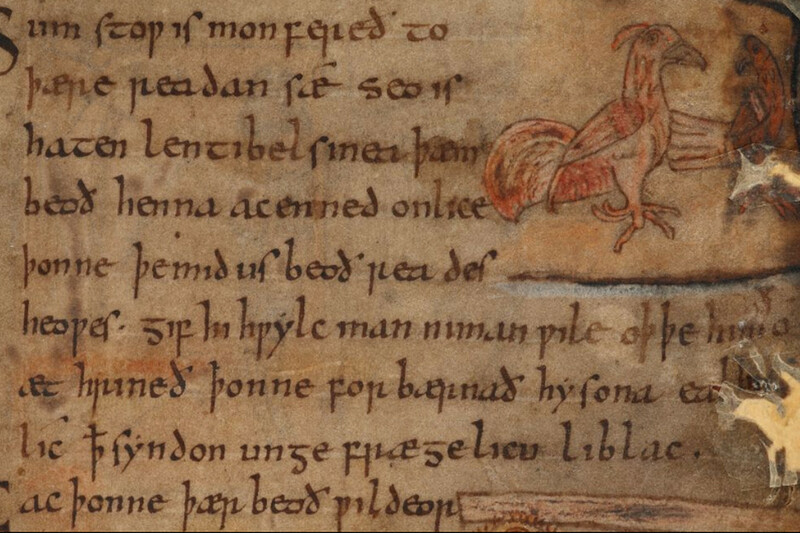 It is generally believed that the poet of Beowulf lived in the Midlands of England and wrote in about the year 1000. It has also been suggested that he wrote the poem, weaving many old songs into it, for members of the family of the kings of the old Anglo-Saxon kingdom of Mercia, who counted Beowulf among their ancestors. If that was in fact the case, he may have been drawing an elaborate analogy. Beowulf relied upon his personal prowess, and the kingdom of Hygelac was destroyed as a result. The kings of Mercia were slow to accept Christianity and, when the Danes invaded England in the ninth century, they did not ally with other Anglo-Saxon kingdoms, but attempted to meet the enemy themselves. As a result, the kingdom of Mercia was destroyed. Was this what the poet was trying to say? By the time you’ve said all of this, everyone left in the room will be really impressed with you. But, since all of them except yourself will have gotten bored and gone home, you’ll decide that fame is fleeting and wordly regard is no substitute for self-respect. This entry was posted in Germany, History, Literature. Bookmark the permalink.